TORONTO, ON – Left Field Brewery has announced details of a new beer brewed in collaboration with Bar Hop to mark the end of this year’s baseball season. 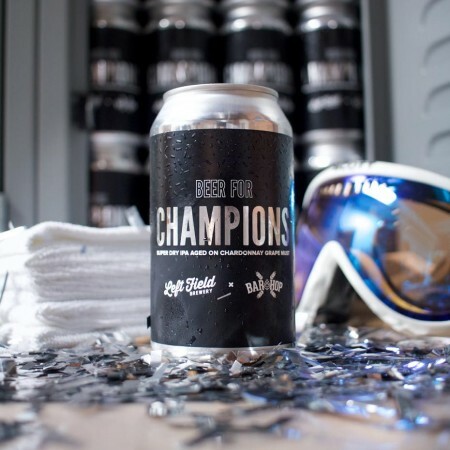 Beer For Champions is a “Super Dry” – aka Brut-style – IPA that has been aged on Chardonnay grape must from Tawse Winery. The new beer will debut tomorrow (October 11th) with a launch event at Bar Hop Session (681 Danforth Ave.) starting at 6:00 PM. Five Left Field beers will be on tap, and the evening will also feature live music from The Swingin’ Blackjacks. Following the launch, Beer For Champions will be available exclusively at Left Field and all three Bar Hop locations while supplies last.